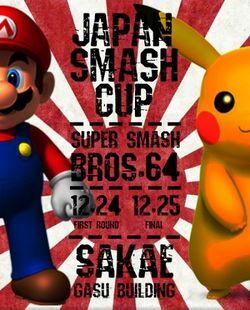 Japan Smash Cup 2016 was a national Super Smash Bros. tournament held in Japan during December 24th-25th, 2016. For the first time in Japanese tournaments, it featured a prize pot (¥200,000, roughly $2,000 USD). Many top players attended, including wario, Fukurou, wangera, kysk, bonobono, Kurabba, shizuku, Yu-Kun and Cafe. This page was last edited on May 29, 2018, at 09:24.